Need more info? View our Motocross / Dirt Bikes buyer's guides. This is the KTM in the middle. Between 250 and 450, and between motocross and off-road. Is it the perfect do-it-all dirt bike? As the phrase goes, there is no replacement for displacement. And for the most part that is true. Very few riders would voluntarily give up cc’s in a racing situation. But Tony Cairoli has shown in the past that with 100cc less than the rest of the field he could still dominate on a KTM 350. An even more compelling case might be Kailub Russell, winning six GNCC championships on a KTM 350 XC-F, and plenty of other riders in XC1 Open Class running a 350 when they could ride a 450. 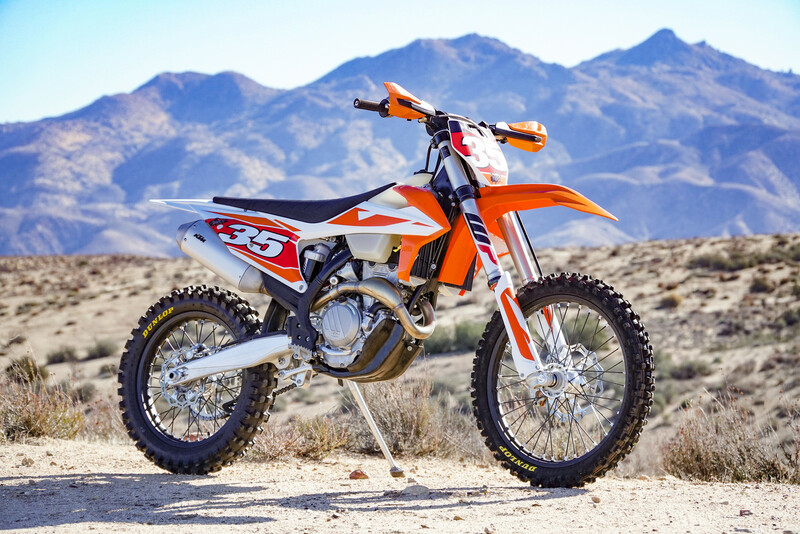 For 2019, KTM’s XC-F line received the same changes that the all the SX-F bikes received and a few that are just on the XC-Fs. All KTMs have a similar engine character and the 2019 350 XC-F doesn’t deviate from that. It has a smooth and linear, yet responsive bottom end power that is easy to use and is way closer to the torque feeling of a 450 than a 250. The mid-range is strong and exciting without any sort of sudden ramp-up in power - it is a straight, predictable line from idle to the mid-range. Then the power steps it up a notch when you get into the upper mid and top end. If you like to rev and want to ride aggressively, the 350 XC-F will reward you if you keep the throttle twisted. The semi-wide ratio, six-speed gearbox has wider spacing than a moto bike, but isn’t as stretched out as full-on trail bikes. First gear is low but not as low as the W models from KTM. The combination of the wider gears and 350 power almost lets you ride in multiple gears everywhere. Meaning, you can ride a trail section in a lower gear and the bike is still making power in the high rpm and doesn’t fall on its face. This is the more aggressive way to ride and it makes you feel like you are attacking the trail. But you could also click up a gear in the same section and it has the torque to pull you in the low rpm, but you could be much fluid and just flow with the trail. I prefered to ride a gear high most of the time, then when the trial opened up, I just let the power get to the upper rpms and I could attack the more open areas without needing to shift. I was surprised how little I shifted, actually. One day of testing was in super tight single track and I was in second almost the whole time. Even when the trail opened up I wouldn’t upshift because the gears are wider and because the motor makes great power all the way to its extremely high red line. There are two maps, and we would only use map 1 for super slippery conditions since it is a little too mellow for most normal riding conditions. Map 2 is more exciting and has a good snap to it with great throttle response. Since we spend most of our time riding either 250s or 450s, it can be easy to forget how much fun, yet potent a 350 can be. As mentioned earlier, the power isn’t directly in the middle of the two ‘standard’ sizes - it feels much closer to a 450. When you make a mistake or a tight 180 surprises you on the trail, the 350’s torque gets you going and lets you recover way faster and easier than a 250. It is also so much less tiring than a 450 that requires more muscle and throttle control. One small downside to the motor is flaming out. Basically, KTM has spent a lot of time and energy making their bikes, and motors specifically, very light. This is, on the whole, is a good thing but one downside is that, with low rotating mass comes less enertia to keep the engine turning over when you chop the throttle. In tight, start-and-stop trails, we definitely had more stalling than other bikes and had us really focus on riding the clutch more and keeping the rpm higher than idle. “Now that the 350 is making roughly the same power of the first gen 450's, the 350 provides more than enough power for the average rider. But it's not just the bike’s peak power, it's the manner in which the bike delivers the power. The 350cc engine is buttery smooth with what seems like near perfect fueling (no bogs, flat spots or hesitations). Tie that in with the handlebar map switch allowing you to select between 2 different maps and you can adjust the power delivery based on the conditions. The TC (traction control) is also really neat. When turned on, it's hardly noticeable in only some situations, but overall, it's hard to tell. I noticed it working mostly by coming up to a road jump with slightly more speed than with TC off. It seemed reduce wheel spin out of the corner right before the jump.” - Seib’s. 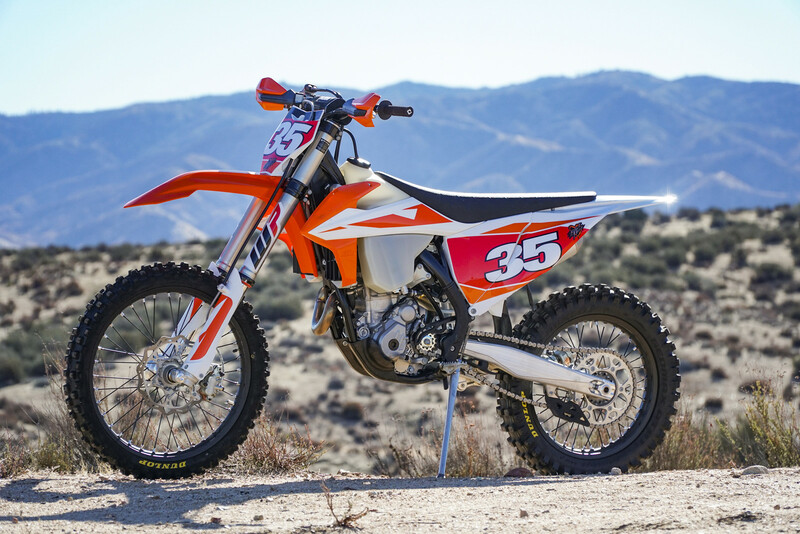 If you read the 250F Motocross shootout, you’d notice that some riders liked the new KTM chassis changes and some didn’t. According to KTM this new generation frame is 2 percent stiffer longitudinally and 10 percent stiffer torsionally. On the 250 SX-F, some testers felt that it was difficult to turn, like the added rigidity made the bike stand up in corners and harder to pivot. But with the 350 XC-F, we found it much more agile and responded very well to tight, quick S-turns on the trail. Our only conclusion is that perhaps this new chassis responds better to a bike with more power and/or more weight, since the XC-F has a bigger tank and some extras that the SX-F doesn’t have. Also, there were fewer objections to the new chassis on the 450 SX-F in the 450 shootout. That being said the 350 feels extremely light for an off-road bike. We rode this bike in the open desert, tight single track, and the motocross track (mostly a vet track) and the XC-F was predictable and nimble-feeling in all three riding conditions. During high-speed riding, we wouldn’t say it is the most planted feeling bike we’ve ridden but it definitely wasn’t unstable or swapping around. When I did catch a rock or rut weird in 4th gear, the bike would bounce off-line for a split second, but recover just as quickly. I’ve been on bikes that don’t react at all to trail obstacles and just drove through them, but when they start to get sideways, it is hard to get them back in line. I think the overall lightness of the bike, and low rotating mass of the 350 engine, make 350 act more in an opposite way - you don’t necessarily plow straight through things, but it recovers so quickly from popping over a ledge or hitting a root that it doesn’t matter and you keep driving forward. The XC-F has the WP AER 48 fork which runs a lower recommended air pressure than the motocross models (9.8 bar compared to 10.3 bar on the 250 SX-F) but is the same fork just with different settings. The WP DCC shock is also the same from SX-F to XC-F with a reworked main piston, but features its own unique off-road settings. As to be expected, when comparing the XC-F suspension to the motocross models that we spend a lot more time on, the cross country bike feels much softer right off the bat. But the whole point of having a more compliant set up for off-road riding is to get a bike to absorb and soak things up rather than deflect and “bounce off” like MX suspension can. Yet even for a moderate pace (not pro racer speed) the fork and shock felt a little too soft. It wasn’t a diving action like we’ve experienced with past KTM off-road suspension, but the fork felt like it was just always lower in the stroke than we wanted. We went up to 10 bar and added three clicks of compression to fork, which helped the front ride height and didn’t negatively affect the quick turning nature of the bike. The shock, while offering plenty of comfort in stock form, did blow through the stroke faster than we wanted when hitting rollers and natural whoops at moderate speed. We went a half turn stiffer on shock high speed compression and, with the fork adjustments, the bike was much happier at higher speeds. “The new XC Suspension is light years better than previous models. I've ridden some of the older models where they forks tend to have a lot of dive, especially when braking into corners. I ran the bike into ruts with quite a bit of gusto a few times and the front maintained both feel traction. The front and rear also seems very balanced. Going back to handling, the bike never had any extreme pitch when transitioning from on the brakes to on the throttle. This is a massive plus when riding off-road where some trails have flat corners or faint ruts that are hard to hook the tire into. We’ve said this before and we’ll probably be saying it again - cross country bikes make the best all around bikes if you an average rider who rides moto and off-road. Even if you spend a majority of your time at the track and hit the trails every once in a while, the 350 XC-F would still be a great choice if you aren’t trying to be a local pro or race moto at a competitive level. We rode the bike on a vet track and had blast passing guys on full moto bikes. The only downsides are that you carry a little more weight up high with a full 2.4-gallon tank and you’ll need to play with the clickers and air pressure to get a stiffer track setting for the suspension. Depending on your riding style, the transmission might also be a con for the track, but for people that don’t like to shift (Vets, we are looking at you!) you can get away with leaving it in each gear for a really long time and it still has the torque to pull down low, and get rowdy up high.